Hi all... So sorry that it has been weeks and weeks since we last updated. Work schedules have picked up, not to mention the amount of time and attention little miss Grace requires as she is growing! We are still working on taking pictures with the camera (not just our phones) more often, and I hope to have a more regular upload schedule for the blogs as well. My job has finally picked up in pace and I am beginning to comprehend the full scope of my responsibilities there. I love working with the students, and I truly feel that working with at-risk students in higher education is exactly where I belong. I'll admit, I had no idea the amount of energy and organization it would take to be a working mommy, and we are still learning how to be the best for Grace that we can be with both of us busy all day. Mark enjoys his job and is gaining more influence and leadership with his colleagues. After two years, it is amazing to see how far he has come; and it's exciting to look to the future possibilities for his career! He LOVES being a daddy... and it's harder and harder to leave for the office each new morning. The last month (and a half) has been busy with family visits, traveling, friends in town, dinner dates in the 'burbs, and adjusting to Grace's preferences- which seem to change daily! 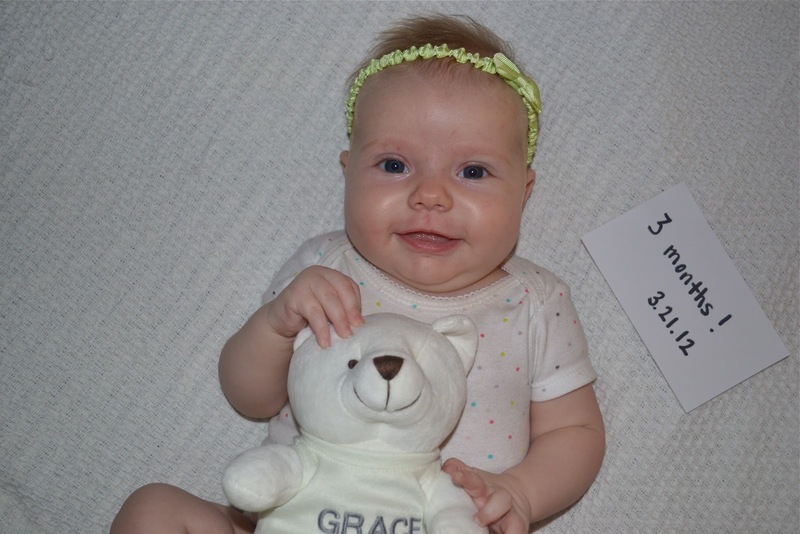 Grace is just such an adorable baby; we feel so lucky to get to spend time with her every day! 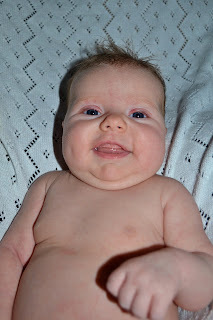 She has learned how to roll over from front to back, and back to front! 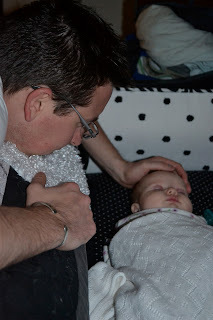 We have learned that she is VERY sensitive to getting enough sleep, and that we have to enforce as much nap time during the day as possible as well as a 7:45pm bed time. Without enough sleep, she just isn't the same baby! And now, the real reason most of you visit our little page.... pictures of Baby Grace! These are from just a few "photo shoots" and I'll be loading our camera phone pics soon. 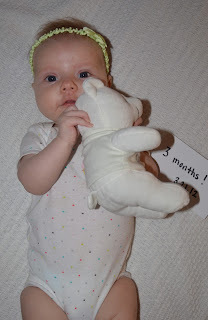 Her 3-month photo shoot was a little delayed.... hence the date on Daddy's birthday! (instead of March 8th. oops!) Enjoy! Happy February, all! We can hardly believe how quickly time is flying (everyone tells you that time will fly with a newborn... they're right!). Grace LOVES her Nanny Faye, a sweet lady who lives in our apartment building on the 10th floor. Mama drops her off in the morning, and Daddy picks her up at 5pm =) Nanny makes Grace SMILE and is very loving and gentle. This has been a huge time saver for us, such a blessing. Mark's job is still going well- he is into his 3rd year with the company, now. He has developed great relationships with clients, customers, and coworkers. We are learning how to manage a household with 2 working parents, but we are also learning to truly cherish every minute we all have home together. This has involved a weekly cleaning/laundry spree on Sundays, meal planning and weekly grocery shopping, and a to-do/ grocery list that updates on both Mark and Alyssa's phones (cozi.com). We'll keep it all together, one way or another! And now, for the real reason you check the blog.... PICTURES! 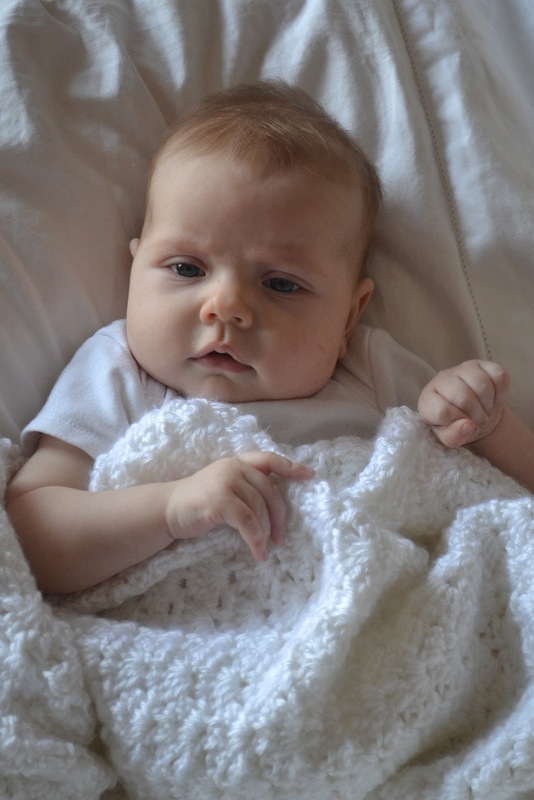 This is the quilt from Gracie's crib. Custom-made lovingly by her Nona (Donna). She loves looking at the patterns, and I can't wait until she can crawl and start to feel all the different fabrics, too! Super cute owl 12-month stickers from Jennifer Brown. love them. 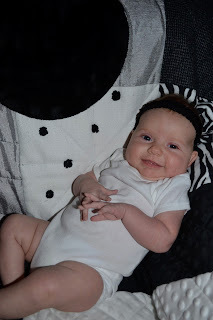 Grace thought tummy time was a blast this night! I wish I could capture her (almost) laughing with delight and excitement. "Can you believe how big I am??? Let's see what I can do during month #3!"